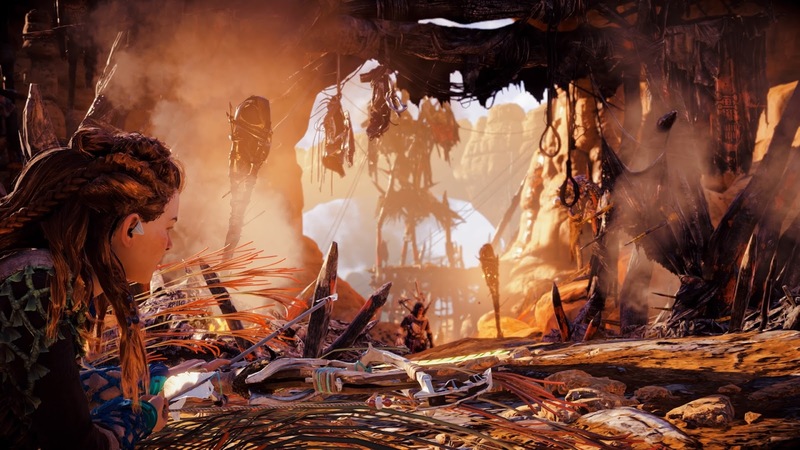 Horizon: Zero Dawn reflects all the strengths of Guerrilla Games as a developer, but also its limitations. It’s a game that offers a grand vision, compelling ideology, and technical brilliance, but it’s also one that can’t quite shake a certain blandness, as it’s let down by arbitrarily sticking to conventions established by far more creative teams. All of that will sound familiar to those who are familiar with Guerrilla’s Killzone series. There is a franchise that pushed hard to make a point about militarism and authoritarianism, and indeed the role that corporate interest increasingly has in both. It is also a series that has consistently pushed the hardware of the consoles it was developed for, as far as possible. It’s impossible to fault the intent behind these games, or their technical prowess, but for all that, it’s also impossible to claim that the overly simple and generic way the narrative was structured and the gameplay works in the Killzone series has aligned it with the same tier in its genre as the likes of Battlefield and Halo. Horizon is much the same, only, instead of being a FPS, it’s that modern hybrid between Western RPG and action game that the likes of Mass Effect and The Witcher have pioneered. This is a game with real soul, for a start, and it is as socially aware as only a studio from The Netherlands - one of the most progressive European nations - could be. The rush of excitement in witnessing what the game promises in its opening hours is difficult to describe accurately, because it really does seem like it’s on a path to being one of the truly incredible achievements in this little art form we all love; but as that excitement settles down, the act of playing it through is like a brutal spear to the heart in its wasted potential. In Horizon you play as Aloy, a young woman who is growing up at a time many, many years into the future, where some calamity has all but wiped out humanity, and those who have survived have reverted to a primitive, tribal culture. That same calamity left the world filled with machines that are shaped like animals and/or monsters, and those now plague the world, threatening what is left of humanity. To make matters worse for poor Aloy, she was born as an outcast, ostracised and unable to even speak to the normal tribesmen and women. That is, until she participates in the proving: a ritual that allows her to rejoin the tribe as an equal. Unfortunately the proving is disrupted by a clan of thugs and bandits, and Aloy is one of the few survivors of the ensuing massacre. She gains special permission from the matriarchs of the tribe to leave her people’s sacred lands, and thus Aloy heads out on an epic quest for revenge. The theme of Horizon is incredibly compelling, promising to look at the best - and worst - of humanity when pared back to its most primitive of forms, when humans and nature need to co-exist with one another. The developers have worked with a scenario in which, in response to man-made progress all but destroying the world, the remaining people return to a culture of animism and resistance to knowledge. While Aloy chafes at this, the narrative presents it as a noble, honourable, and largely peaceful way to live. 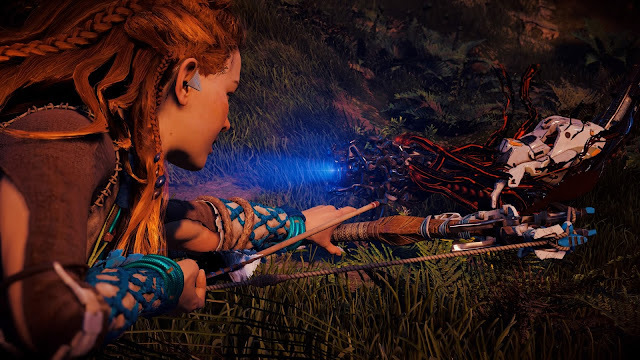 Aloy is bullied a little as she struggles to gain a position in her tribe. Afterwards, she encounters some incredibly flawed people in her journeys; but for the most part, aside from the cult that’s she’s chasing after, the existential threat humanity is fighting against is nice and neat: it’s the machines, which are portrayed as little more than savage monsters, and therefore we shouldn’t feel bad about destroying them. And of course, within that scenario, there are twists and turns, though never really anything that will surprise. 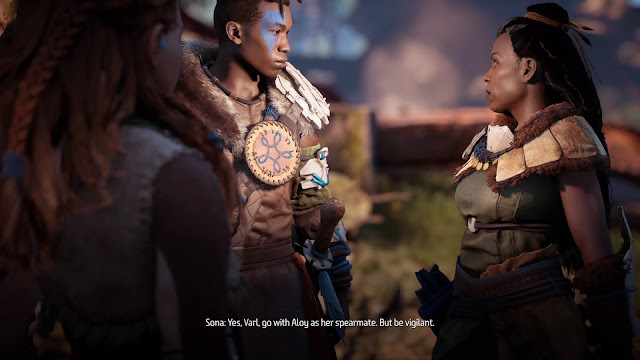 There are moments when the narrative seems to want to explore the moral implications of what is going on in this world, but other than giving Aloy the ability to respond in one of three ways (using her “heart, head, or fists”), these hobbled attempts to go deeper into the narrative dry up before you get the chance to dive in. No sooner does the narrative start to ask players to think than it pulls back, perhaps concerned that it will lose them, instead pointing them to the next big monster that’s posing an immediate and visceral threat. Horizon’s strengths are those moments when you’re in civilisation. The world is absolutely massive, but it’s those points on the map, where clusters of houses (and the occasional city) sit, where we see the most convincing personality and character come through. As Aloy wanders around town she’ll see people going about their work, or storytellers keeping the children entertained, or people sitting down to meals with one another. Each village, town, and city has its own visible traditions and people, and simply soaking up the atmosphere, and feeling the pulse of the tribal heartbeat, is an experience in itself. It’s disappointing, then, that there’s so little to do in these spaces. Interactions with an area’s denizens doesn’t account for much more than being tossed a handful more quests, and aside from trading with a merchant, or saving the game, there’s not much else to do in towns; they’re simply safe spaces where enemies don’t visit. This superficiality I found to be painful. Why go to all the effort to create these distinct, vibrant cultures you find travelling between cities in Horizon, if you’re not going to provide the player with any way to interact with them? 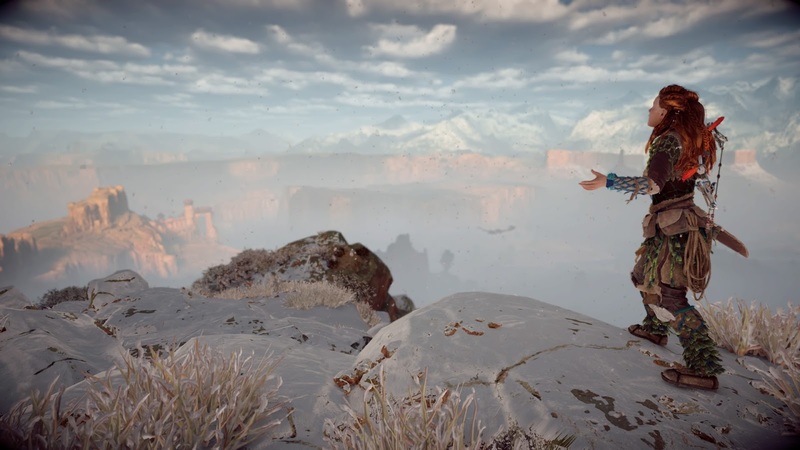 This is similar to the game’s approach to moral themes; over and over again Horizon threatens to be something truly deep and intense, and then pulls back to stick to the safe and straight “blockbuster” road. In fact, the entire world feels barren more often than not. Environments are utterly, unbelievably gorgeous; but other than travelling across them, killing hordes of enemies, or figuring out how to defeat the occasional super-powerful enemy, there’s not much to do, other than simply experience it in all its splendour. Quests are almost universally formulaic: you’ll either be hunting for items, tracking someone or something by following their or its trail, or killing enemies. There’s an occasional diversion when you need to take down a den of bandits, but that’s common to just about every open world action game these days. As the game wears onwards, it becomes quite clear that it’s big and open for the sake of it - but that openness does very little to enhance the world. It’s as if the developers were inspired by The Witcher 3’s world and quest design without really understanding that The Witcher 3 worked because everything was built into the world in an organic, believable fashion; here, the quests are there because they’re arbitrarily expected to be there. 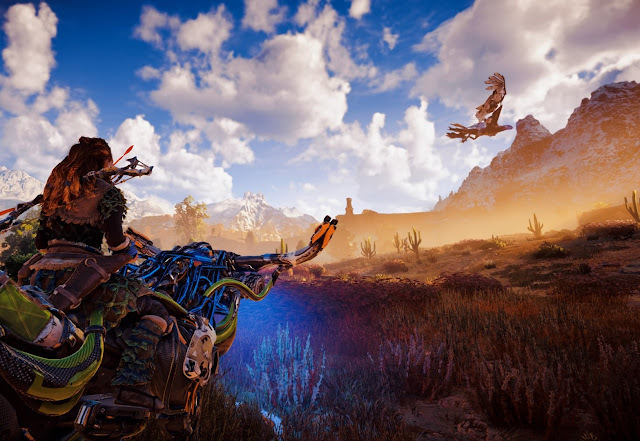 More than anything else, though, what frustrated me the most about Horizon was the way its overall narrative almost disappears after the opening chapter. When you’re restricted to a tiny corner of the map, and set on a very linear path to progress through the tutorials, there’s a far stronger sense of character, worldbuilding and narrative. Aloy’s relationship with her adoptive father is touching. The bigotry she experiences as an outsider (a relevant theme today if ever there was one) is affecting. The time the game takes in presenting players with a festival to explore is an exciting reward for effectively completing the tutorial, and helps deepen a sense of the kind of culture Aloy belongs to. But as Aloy sets out on her quest proper, the distances between things get longer and, with it, the narrative loses focus. 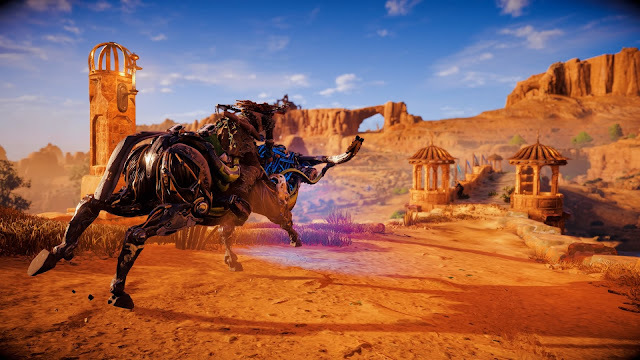 You spend more time riding a mechanical bull across an outback-like arid environment (which, admittedly, is a joyful hoot at first), than you do discussing the murder of one of the main character’s sisters through the actions of his best friend. So often with open world games developers struggle to balance the size and scale of the world with giving players a meaningful experience while being in it. Horizon represents perhaps the most extreme case of stretching content over too much space that we’ve seen in a game yet. Combat in Horizon is a curious - and quite mixed - bag. The primary enemy are those robot monsters, and at their best they offer real challenge and excitement, in a way not unlike Monster Hunter. The bigger, tougher enemies are fast, furious, and can only really be defeated by carefully targeting their weaknesses. At its absolute best, Horizon is a clever case study in careful planning: you’ll hide in the bushes and carefully watch as a hulking robot monster makes its way around a patrol route. Then you’ll set up traps that will pin the monster temporarily. From there you’ll bombard it, while pinned, with missiles that inflict status damage, before whipping out the trusty bow to start slowly whittling down its health. Unfortunately, the ambition of the open world and the lack of precision in level design when compared to Monster Hunter made more than a few of these encounters easy to “game.” More than once I was able to get a large enough rock between myself and my mark so that I could comfortably keep the beast on the other side. With some patience and a lot of status-inflicting arrows, I was able to take it down without too much risk to Aloy. Equally unfortunately, those set pieces don’t account for the more mundane stuff. For the most part you’ll be sneaking into bushes and waiting for weaker monsters to wander past, at which point you’ll silently strike them to take them out without giving yourself away, before moving on to the next target. It works, but it’s not that engaging. Things take a turn for the worse when you’re up against human enemies. These sequences play out like every bland action shooter game that you’ve ever encountered. A bit like Killzone set pieces, really. So the game’s insistence, at regular intervals, on tossing bandit camps at you to infiltrate and kill everyone within is grating in the extreme; only made slightly more bearable because in some of these side-quests you’ll be accompanied by the brightest, sunniest psychopath you’ll ever encounter in a game. If all characters were written with the wit, moral ambiguity, and charm of this fellow, Horizon and I would have got along just fine. 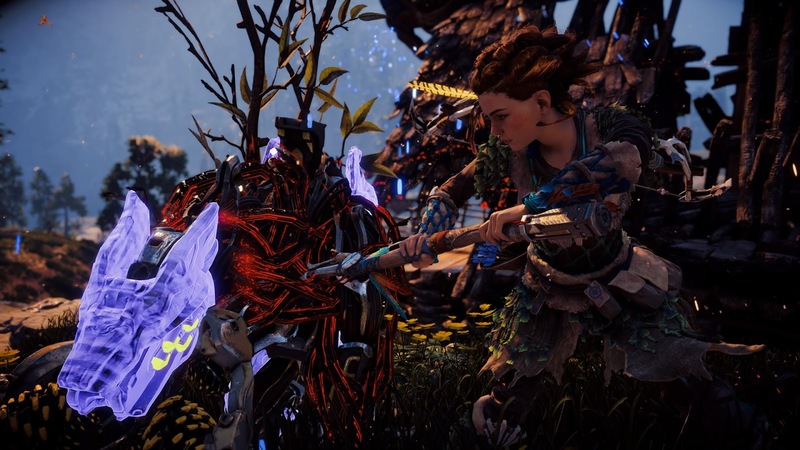 Although Horizon is billed as an RPG, the careful management of statistics and character development that is a typical feature of the genre is very much taken out of your hands. Levelling up provides a bit more health and skill points which can be distributed among a couple of limited skills trees, but it’s never something that you’ll spend much time agonising over in order to build the perfect character. There’s also a limited ability to upgrade weapons and armour, but the impact that these have is, in practice, quite minor. 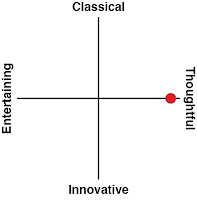 None of this matters when you take the package as a fairly casually-orientated action blockbuster for the mainstream. But for some, especially those who came expecting an RPG, there will be a point around 20-30 hours in when they’ll feel the need to search for additional depth, and it’s just not there. RPGs are about potent narratives, character development, and layers of depth, and this game works too hard to be an action game to really meet the billing that it is sold under. Horizon still manages to be compelling, and it does so for a couple of reasons. On the most basic of levels, as limited as the combat can be, it’s also really exciting at times. When all of Guerrilla’s intentions click together, there’s something very intense about diving out of the way of a giant robot enemy, only to spin around and fire off a series of arrows to hit weak spots with precision. Guerrilla understand the flow of action as well as anyone, and the cinematic speed and dynamism with which Horizon’s combat moves is thrilling, and remains so right through its runtime. Secondly, while I’m no fan of what it does for the pacing, the open world itself is utterly breathtaking. From the mist-enshrouded mountains far in the distance, to the fine detail of the grass up close, Horizon has a sense of detail in its scale that will continue to inspire awe and wonder with every new area visited. Such is the confidence that the developers (rightfully) have in their engine, that the game has the highest quality in-game camera mode that I’ve ever seen. 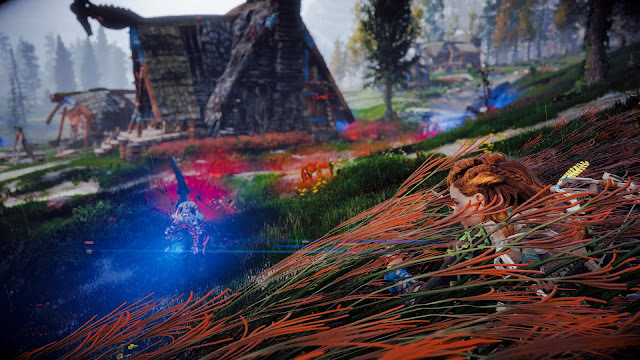 It’s almost like having access to an SLR camera on Aloy’s journey; you’ve got full control over depth of field, filters (including black & white), contrast and white balancing. My favourite thing to do in the game quickly became taking photos as I explored, in a high-contrast black & white style that looks like Trent Parke was along for the ride. Oddly enough, doing this helped me connect more with the game’s world than the narrative or gameplay did; suddenly I was creating little stories of my own as I went along and was capturing moments of the game. I’ve got hundreds of these photos now; they added to the playtime significantly, but, boy, have they been worthwhile. 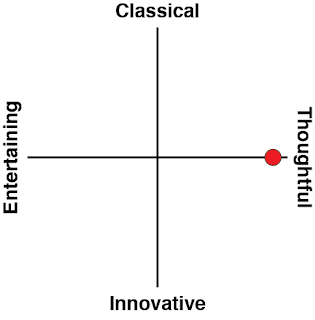 And while all this might sound like faint praise, as it doesn’t relate to any of the conventional “narrative” or “gameplay” elements that people generally look for in games, it meant that I haven’t put the game down in the weeks since I started playing it. It’s rare that I can sit down and play a single game for eight or nine hours in a single sitting. That I’ve been able to do that with Horizon, even if half that time was spent looking for killer photo opportunities, is meaningful. In highlighting issues with the game, I’m also ignoring the grand vision, which the development team does nail over and over again. There are moments when, riding on the back of my trusty mechanical bull, I’m cresting over the ridge of a small hill with the setting sun striking at just the right angle, that I look over the plains ahead of me, complete with their gauntlet of robotic enemies. It’s those moments that I think there’s the potential here for Horizon to be Sony’s genuine answer to The Legend of Zelda… just as, many years ago, I entered Hyrule fields for the first time in Ocarina of Time and was left in utter wonder at the scale of adventure I saw before me, leaving me thinking that Nintendo was the future of everything I’d ever want in games. To get to that point, for a Horizon 2 (one assumes this game will sell well enough to validate a sequel), the team at Guerrilla need to be bolder. The creative team needs to find writers willing to back up the narrative context with a story that has meat, and the gameplay designers need to dare do things differently to what has come before. Horizon is a remarkably refined and technically brilliant game, but Guerrilla has yet to prove that it can take that next step and produce a genuine classic.